In a recent snap poll conducted by NOI Polls Limited, over 500 airline passengers have expressed grave dissatisfaction with the quality of services rendered by local airline operators in Nigeria. The poll, conducted in February 2012, which sought to appraise current developments in the aviation sector, found that most passengers condemned the airline operators for persistent flight delays, missing luggage, and poor customer service offered by front desk officers of airline operators, amongst others. In particular, several passengers expressed disappointment at the impolite and unfriendly behaviour displayed by some front desk officers. The poll also revealed the level of awareness of air passengers regarding current reforms in the aviation sector. The results showed that 64% of the respondents were aware of the on-going remodelling of airports, 27% were aware of the upgrading of airport infrastructure; and 3% were aware of security and air-apace management issues. In furtherance, when asked whether they agree that the current Minister is making some progress in the aviation sector, about 6 in 10 respondents chose between strongly agree (11%) and agree (49%). However, while 21% of the respondents were indifferent, 16% disagreed that some progress has being made by the Minister. Consequently, on the areas the Minister of Aviation should be focusing her attention as part of the aviation sector reform, 24% of respondents were of the opinion that she should focus on “Improvement in Customer Service”, while 17% and 16% chose ‘’Airport Security’’ and ‘’Upgrading of Airport Infrastructure’’ respectively. Also, 6% each selected ‘’Safety of Air Space’’ and ‘’Power Stability at Airports”; while 3% and 2% chose “Control of Airport Traffic” and ‘’General Ambiance and Airport Cleanliness’’ respectively. Interestingly, 26% of the respondents chose all of the above. 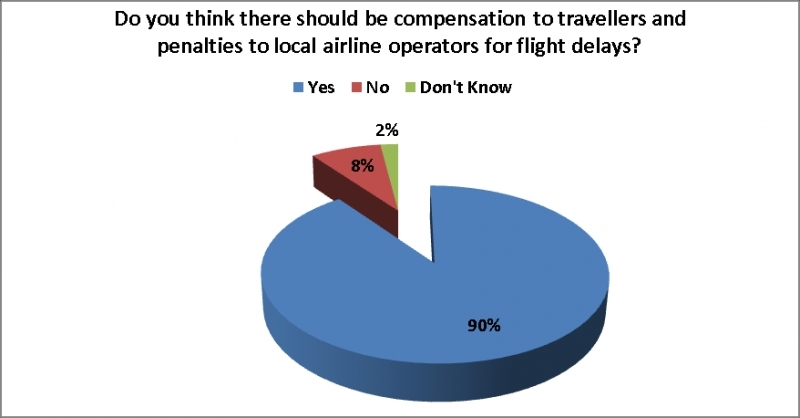 Finally, the poll revealed that about 9 in 10 respondents were of the opinion that airline operators should be made to compensate travellers for service inefficiencies such as flight delays, as well as pay penalties to the regulatory authorities, as these would serve as deterrents for future occurrence and help improve service quality. In summary, air passengers were clearly of the opinion that whilst the on-going remodelling and upgrading of airport infrastructure were welcome developments, the projects were taking too long to be completed; thereby hindering the smooth operations and general ambiance of the airports. Therefore contractors handling the projects should be urged to speed-up their pace of work and strive for prompt completion. Also, there is need for training and re-training of the front desk officers of airport operators in order to enhance the customer service experience of air passengers; as well as regular monitoring to ensure that standards are maintained. Results are based on face-to-face interviews of 510 adults (air passengers), aged 18 and older, and conducted in February 2012 at the Nnamdi Azikiwe International Airport Abuja. For results based on this sample size, we can say with 95% confidence that the margin of error is plus or minus 4 percentage points. The margin of error reflects the influencing of data weighting, while question wording and practical difficulties in conducting surveys may introduce error or bias into the findings of public opinion polls. NOI Polls Limited is a leading opinion research and knowledge management organisation, which works in technical partnership with the Gallup Organisation (USA), to conduct periodic opinion polls and studies on various socio-economic and political issues in Nigeria.